Originally bred to hunt fox, badgers, and rodents, the rugged—yet dignified—Scottish Terrier is a spirited little dog with a big personality. While aloof with strangers, the Scottie loves the companionship of family. His compact body houses a bold Scottie personality that may intimidate first-time dog owners, but his playful nature and loyalty win him many fans. The feisty and independent Scottish Terrier can be difficult to train due to his high intelligence and propensity to ignore a request in favor of his own agenda. Scotties have been popular in the White House with presidential owners Franklin D. Roosevelt, Dwight D. Eisenhower, and George W. Bush. Fala, the Scottish Terrier owned by President Franklin D. Roosevelt, is depicted at the former president's memorial. The Scottish Terrier is top dog on the Monopoly board, as the Scottie piece is the most popular, outranking even the top hat. The Scottish Terrier is also known as the Aberdeen Terrier, Scottie, and Aberdeenie. Coat - The Scottish Terrier has a hard, wiry overcoat with a softer undercoat. He proudly displays a beard and dignified eyebrows. The coat is light shedding, but requires weekly brushing and regular trims to maintain its appearance. While dogs similar in appearance to the Scottish Terrier have been painted and written about since as early as the 1400s, there is some disagreement over the origins of the Scottie. Short haired terriers from Scotland are credited for the development of the Skye Terrier, which may be the origin of a number of terrier types including the Scottie. The original duty of the Scottish Terrier was to protect farms and homes from rodents—a job they still take seriously today. The Scottish Terrier Club of England was formed in 1881, and the breed was introduced to America shortly after. The AKC recognized the Scottish Terrier in 1885 and the breed gained popularity in the United States during the 1930s and 1940s. The Scottie is a friendly dog who bonds closely with family members, but he may be aloof with strangers. Though the Scottish Terrier is less showy with his affection—he may be stoic where other terrier types are enthusiastic with their greetings—he is known for his devotion to family. As with all terriers, the Scottie may be scrappy or confrontational with other dogs, and may be hesitant to accept anyone—human or furry—who isn't family. Are Scottish Terriers Good with Kids? Scottish Terriers raised with children may be suitable as a family pet, but the breed is not recommended for small children or kids who do not have experience with dogs. When properly socialized with children, Scotties happily act as a protector on their behalf. Are Scottish Terriers Good with Other Pets? Scottish Terriers are big dogs in small bodies—they may attempt to assert dominance over other dogs regardless of their size. Scotties may do well with other dogs if raised with them, or if they're socialized from an early age. Due to their high prey drive, they are not likely companions for cats or small animals. The Scottie takes his job as protector of the home quite seriously and will alert you to any newcomers. He has a big-dog bark, which he may use to scare away potential intruders. Scottish Terriers are high-energy dogs who require activity—physical and mental—to prevent destructiveness, barking, digging, and other boredom-induced behaviors. Can be strong-willed and stubborn. Has a high prey drive. Potential for dominant behaviors with other dogs and people. May display resource guarding behaviors. Destructive behaviors may occur with boredom. Indoor Scottish Terriers can adjust to most living spaces, but they require plenty of exercise and mental stimulation to keep them happy. They can nuisance bark if bored—apartment-dwelling neighbors may not appreciate the noise. Outdoor Outside exercise is a priority for the energetic Scottie, but the independent breed has a high prey drive and loves to run and chase, so leashed walks and fenced areas are recommended. Exercise A few romps outdoors and play inside to total half an hour to one hour per day—more is better—will keep the Scottish Terrier happy and healthy. Endurance Energetic and happy to run, the Scottish Terrier loves agility and other activities that require bursts of speed. They do not have the stamina for long runs or strenuous activity. Running Miles: While the Scottish Terrier is not an ideal running companion, he will gladly join you on daily walks. Hiking Miles: Hikes aren't a favorite activity of the short-legged Scottie, but the breed may enjoy nature trail walks or easy, on-leash hikes. The breed has a high prey drive and is likely untrustworthy off-leash. Food The general recommendation for how much high-quality dry dog food (based on average weight and activity level) to feed a Scottish Terrier is 1 to 1½ cups per day, given in two meals. Scottish Terriers may guard their food. Children should never be allowed to touch or remove food while a Scottie or any dog is eating. Alone Time The Scottish Terrier is affectionate when his family is around, but is self-reliant and may be left home alone for four to eight hours per day. Some Scottish Terriers may become destructive when left home alone; crate training may be necessary. The Scottish Terrier's wiry coat sheds minimally, but needs plenty of attention. Brushing once or twice per week and regular trips to the groomer are necessary. Baths should be minimal to prevent skin irritation. Trimming is accepted for pets, but Scotties meant for show should not be clipped as it can make the hair softer, which is not within the breed standard. You can minimize serious health concerns in a Scottish Terrier by purchasing him from a reputable breeder who engages in responsible breeding practices, and through screening for common diseases and conditions. The Scottie may be stubborn and headstrong and can be difficult to train due to his self-sufficient nature. Persistence, consistency, and positive reinforcement are the best route for basic obedience training. Early socialization with people and other dogs is important to raise a well-behaved adult Scottie. Agility training may be a good fit for the athletic Scottie, but advanced tricks and obedience are not areas for which Scottish Terriers deem their time worthy. 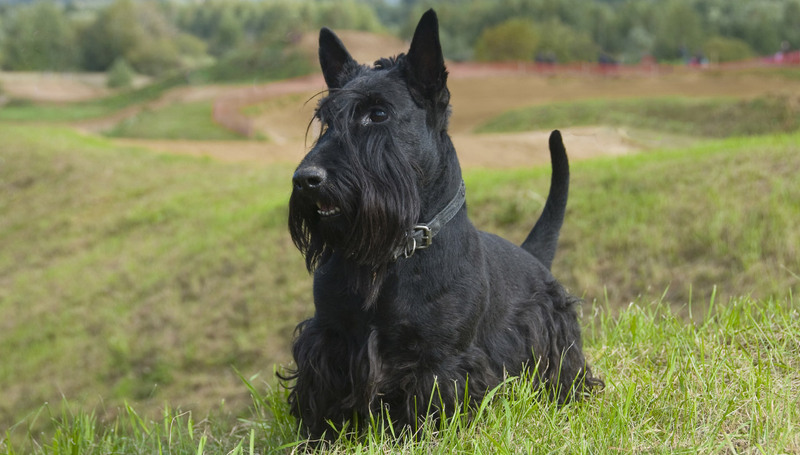 The Scottish Terrier is not ideal for use as a sporting dog, but his high prey drive and love of the dirt may make him suitable for Earthdog training. Scotties don't mind the water, but they're not going to win any prizes for swimming. They have short legs and solid bodies, so they don't swim well. Supervision near water is important to keep Scotties safe. Can Scottish Terriers be white? The Scottie can be black, grey, brindle, or wheaten—which is similar to white—in color, but never white. A white dog that looks similar to a Scottie would likely be a West Highland Terrier. Scotty Cramp is a hereditary disorder that can cause limb spasms or collapse. It is often stress-induced and can occur during excitement or strenuous activity. The condition may be related to serotonin deficiency and is present in the Scottish and other terrier types. As it is genetic, affected dogs should not be bred.